After many years of holding the Costume Contest before the Monster Dash races and having only modest participation, in 2015 we decided to move it to take place at the Friday night’s Monster Ball Pasta Party! It’s been a great success! TOP THREE PRIZES are Ashland Chamber Gift Certificates – you can win up to $150! These can be used at many Ashland stores and restaurants. Plus gift certificates from RENAISSANCE ROSE. See below for list of prizes for the top winners. Come and test out your race costume, or come in a completely different costume! The contest will be held at 6:30 pm ON STAGE at the Historic Armory during the Monster Ball Pasta Party! There will be a non-competitive costume parade held at the beginning of the contest. 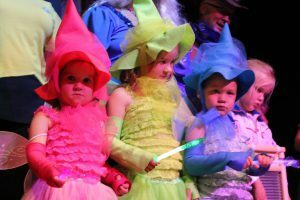 This for-fun parade is mainly for our youngest members but can also include others that want to show off their costumes but don’t wish to participate in the judging part of the contest. All participants ages 4 and under will be placed in this category, but it is also open to anyone of any age who doesn’t want to compete. Judging will take place on the Armory stage in each category. 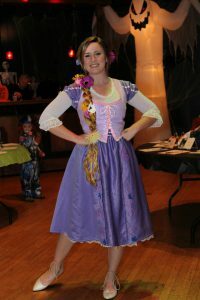 Judges will be looking for costumes that YOU have created – not purchased through a costume vendor. Winners in each category will be awarded a winner’s ribbon and will become a finalist for the overall best costume. 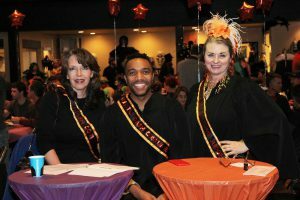 2016 Monster Ball Costume Contest Judges! Amy Preskenis & David Kelly are our Costume Contest organizers. Amy Preskenis is an ASF board member, and a teacher at Walker Elementary School. David Kelly is an actor at OSF, and is part of the theatre department faculty at SOU. They make a fabulous team! Ann Wilton, Judge, has been the owner of Renaissance Rose in Ashland, since 2010. Specializing in costumes, but carrying a little bit of everything, Renaissance Rose is a beloved Ashland tradition! She not only judges the competitors, but also outfits the judges in costumes and our emcee in fabulous fashion! Kelly Jean Hammond is part of the Paddington stores Hammond family! She has a background in music and theatre, but came home learn the family business. Kelly Jean manages the Paddington Jewel Box and you may have seen her performing in one of many shows at the Camelot Theatre. Shaun Taylor-Corbett is in his second season with OSF. You may have seen him this year in Henry V or Love’s Labor’s Lost; or in last year’s Off the Rails or Beauty and the Beast. He’s excited to be joining our family of Monster Ball judges and can’t wait to see your costumes! “Like” the Ashland Monster Dash Facebook page to keep up on announcements about the race, the Costume Contest, and the Pasta Party! Or visit the website regularly for updates.